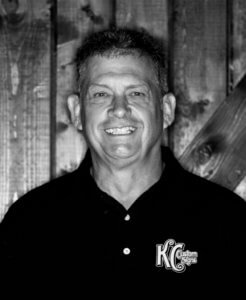 Andy – is a Production and Installation Specialist at KC Custom Signs. Andy works hard using all types of materials–including metals, plastics, and wood. Before working at KC Custom Signs, Andy lived in Ohio, Indiana, and Illinois. He hopes to spend retirement hanging out with his grandchildren.